This was the second to last day “Little Man” was here. I have been wanting to share these pictures with you before I take anymore this week in Texas! He was SO happy to be at the beach! We couldn’t get him to stay under the umbrella, he wanted to be down by the water every minute. I don’t think any of us could imagine how much he was going to take to the ocean. He takes off as fast as his little legs would crawl to the water. His mother is racing to keep up with him. 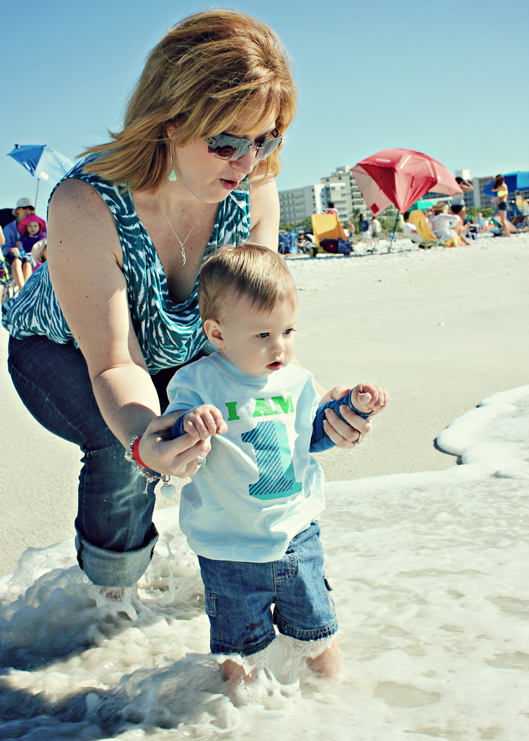 Little Man and Mother test the waters…The water is just a little nippy. Notice the surprise look on their faces. 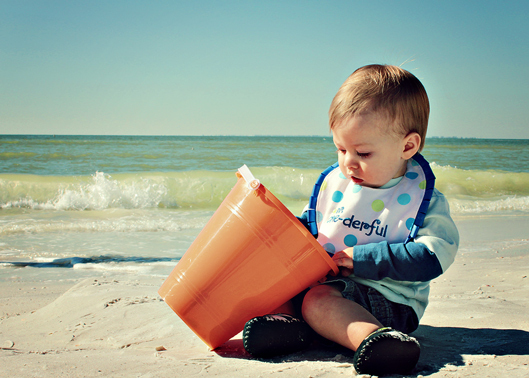 But all is well…he is at the beach with his pail! What is this white stuff in my bucket? 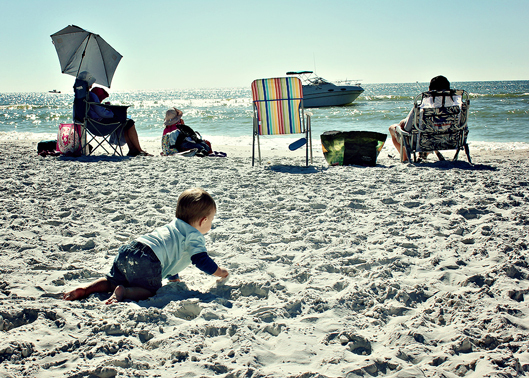 As you can tell by this picture, he was just mesmerized by the gulf waters, he couldn’t take his eyes off of it, even as his mother was walking away. He definitely is my grandson…you have to pull me away from the peace, serenity and tranquility of the ocean also. Do you feel like that when you are at the beach? Does it just pull you in, where you could just stay there forever? Thank you for spending just a few minutes today with us. We value your blogging friendship and hope you have a great day. We were featured on Hood Photography for this post! What an honor, you can see the link here. Lovely photos of the baby and the mother. I could definitely sit at a none busy beach for hours and just listen and watch the water. He is so cute. He’s a precious child. Blessings! The pull of the beach affects us all. The old as well as the young. These are just glorious photos of your grandson. What a precious boy, Laurie! 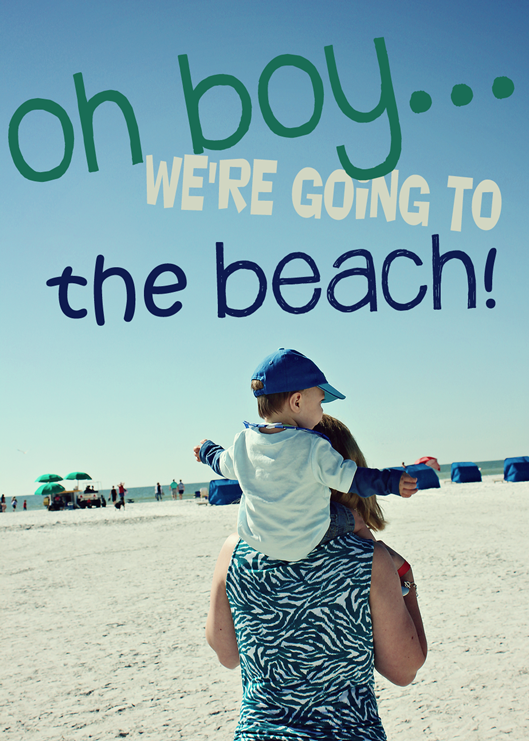 Of course, the Little Man wants to be on the move … waves are so enticing! And oh my, beach pics when we have snow and cold! Thanks for joining Walk and Click Wednesdays! Have a great day tomorrow my friend. It looks like you caught one of the few really pretty days we have had this year! The pictures are just great!!! How kids love the beach!!!! There is nothing like babies at the beach. What a cutie. Looks like so much fun. I could use some beach time right about now. Ohhh…I remember going to the beach in Michigan with my niece when she was that little. She would stand at the edge and jump up and down in the surf. 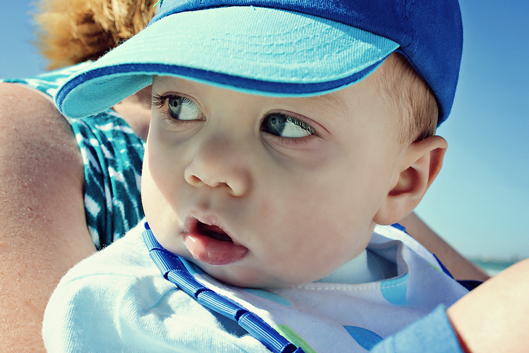 So adorable — and so is your little one. Fantastic photos – of course your male model is adorable!! What type of camera do you use? So much fun! Beautiful pictures, he is adorable. Lovely family. I have to ask you, is the boat close or is it just the picture? I know there is a perimeter, but it looks like it is ready to cruise pretty close to the shore ! And look at those waves, wow!! Lovely family pictures Laurie. I too am mesmerized by the ocean. It is SO lovely to see you visit here today LuAnn! Hope things are wonderful over there at your end. Wonderful images. The last one I especially love! 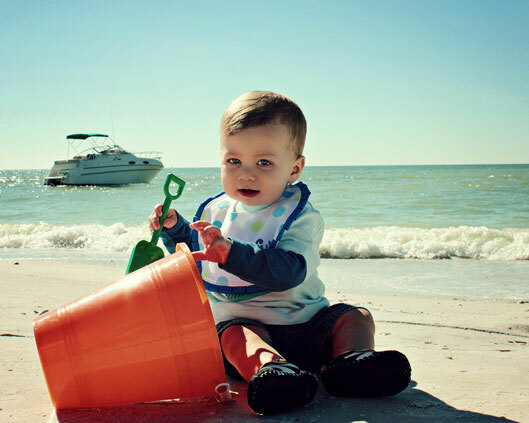 What lovely photos of the beach and your darling little guy!! I bet he and his mother were in heaven;) I know how much I value every second I get to spend with my family. I 100% agree! I love to be by the water, in the water, on the water. We lived at a lake and it was a way of life. Man, you live in a great location…I would just die. Looks like everyone had a wonderful day, thanks for sharing your photo’s Laurie. I can’t wait to see your Texas photos. Oh my gosh, I am so jealous!!!! I love, love, love the beach. If I could live there I would! What a darling child! He is beautiful! Laurie *mesmerised* is exactly what you have captured there in the photo of Little Man ! Thank you so much for this lovely comment. It was an amazing day with Little Man! These photos are excellent. The innocence of youth. It must be so difficult for you to see he and mum move away. The water in general, whether the lake I grew up on or an ocean, is always calming. Hope you are well. Wonderful pictures! I took very similar ones yesterday when my “little girl”, 2 was visiting us and we went to the beach! Fun!! I grew up at the beach (NJ, but still a beach) and just love being near the water and smelling the salt air! And you spent the weekend at the warm beach, while I snowboarded all weekend! How’s that for contrast! !